In our digital age, we spend most of our day time sitting and staring the computer screen. We know that it’s not good in the long run. Researches have suggested that it’s good to take a break often from sitting too long. But it’s not easy for those who work from 9 to 5 trying to complete work. With the best adjustable standing desk, you can alternate between standing and sitting throughout the day. Standing more also helps improving blood circulation and shaping your body. To help you avoid or minimize experiencing back and neck pain, it’s a smart choice to get a standing desk that’s adjustable to suit yourself. The X-Elite Pro is an adjustable standing desk that is good for a small room. With this desk, you can have up to 2 monitors (17 inches) and all your basic computer accessories. The most adjustable standing desks in the market, you can have up to 11 different positions for ergonomic comfort. It makes you easy to move throughout the day. This is the standing desk designed for those who are looking for most people. The UPLIFT’s standing desks are one of the favorites among experts. Even review website like The Wirecutter also selected the UPLIFT Bamboo Stand Up Desk with 1″ Thick Desktop. 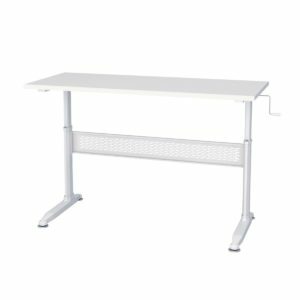 The aluminum construction and support legs are strong enough support the desktop with several monitors, a heavy desk lamp, and other useful accessories on the desk. The advanced, automated feature for quick & easy preset height adjustment. The motorized legs smoothly and powerfully adjust the height as desired. 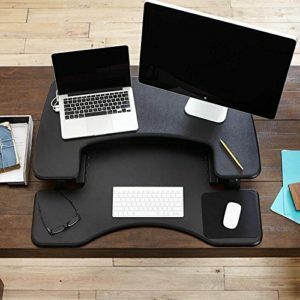 Ideal for big office rooms, which takes a lot of your space. 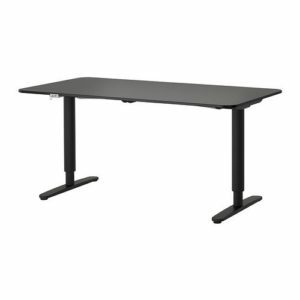 This is an only-unmounted and dual adjustment desk, which is recommended for computer laptops or monitor up to 12 lbs. The surface size is 24″ wide by 18″ deep. It will not fall over. Very stable. This sit-stand desk helps your back to be more comfortable. A lot. 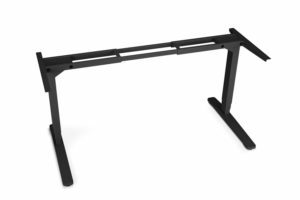 You can easily customize your Jarvis adjustable-height desk by adding your own desk top to our robust sit-stand desk frame. With this desk frame, it’s a good idea to buy an IKEA tabletop and an anti-fatigue mat. Large and long enough for both sitting, standing and walking. the desk wobbles a lot at standing heights for a 6′ tall person. Each time we review furniture products, it’s hard to not include IKEA for its easiness to assemble and good quality. The Ikea Bekant Desk Sit/Stand is well-made. The surface is quite durable and stain resistant, so it’s easy to keep clean. It’s quite expensive than many standing desks in this list. This is a nice desk for multiple uses. You can either keep in the laundry room as a folding table or you can move it as needed for a study desk or buffet. The wooden-made on top is good for those purposes. Sitting all day is worse for you. 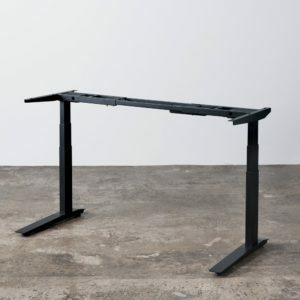 This standing desk is made to help you standing more. It also helps reduce back and neck pain. 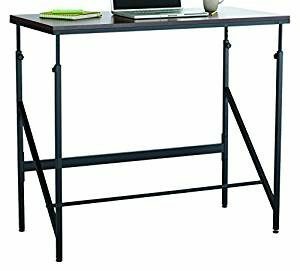 This professional grade standing desk has 4 memory presets to save your perfect sitting and standing heights. It’s very easy to set up. And it works like a charm. The desk makes a very little amount of noise – it’s not completely silent, but it won’t disturb anyone. Very solid piece. It takes a little patience to install. This design promotes better posture. 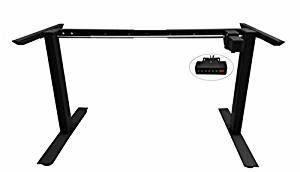 The adjustable height of the DEVAISE Standing Desk-55″ is from 29″ to 44.9″ with crank handle, which meets most people’s standing height needs. For starters, this Ergodriven Spark converter is very cheap. It’s the cheapest choice in this review. With the Ergodriven Spark standing desk, you can start standing quickly with strength and stiffness for only $25. Yet, it’s a good way to begin standing. It’s quite ergonomic and robust. Of course, it also looks great. Although it’s cheap, but it’s rock-solid and a perfect solution for workspace for most people. 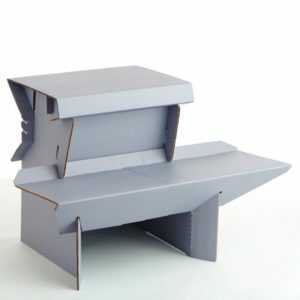 It’s easy to assemble, sturdy, efficient, and recyclable. A great investment. And environmentally friendly. 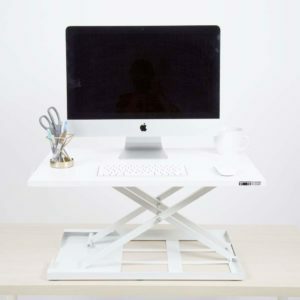 An easy, convenient way to do work while feeling well is using the best adjustable standing desk that’s easy to adjust. Switching positions between sitting and standing helps you both feel and work better. This list will help you choosing the best standing desk this year. You should have it in your office or home office. The adjustable standing desks listed here were selected from hours of research and reading reviews. Price, build-quality, how easy it is to setup and adjust are some of the factors you have to consider. Whichever standing desk you buy should be very stable and operational for many years. The best standing desk should accommodate your height. 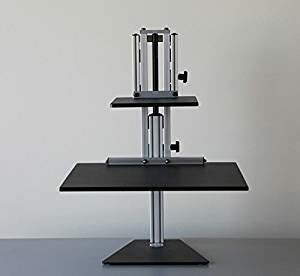 The top best adjustable standing desk for home office should be also usable by just about everybody. Some standing desks are much better than others. The good ones are either more customizable, easily adjustable, or are just better for most people. Whatever adjustable standing desk you’re going to buy, you’ll enjoy the flexibility to stand and move around in your home office.